ALF Dentist – What is better ALF Appliance or Braces for Crooked Teeth and Bad Bite? ALF Appliance and Braces do two different things. Teeth get crowded and crooked because the jaw is too small and there is not enough for the teeth to fit in the jaw. The ALF is an expander that produces a natural increase in the size of the jaw. The “expansion” creates the room or an increase in bone volume. If there is insufficient space in the jaws, the teeth will not fit. Braces on the other hand, can straighten crooked teeth as long as there is enough room in the jaw. When there is true underdevelopment and crowding, it is proper to do expansion to get bone development and space (use ALF appliance) followed by braces or invisalign to uncrook teeth. An ALF Dentist or ALF Orthodontist uses this appliance as his or her go to for tooth crowding. The ALF Appliance is a Elgiloy wire of 0.025” or 0.028”. The ALF aka. Advanced Lightwire Functional has a high degree of flexibility. ALF can be adjusted to increase the size of the upper and lower jaws. ALF Appliance was invented by Dr. Nordstrom in the 1980s. The ALF uses the Tongue ( “functional force” ) and strategic adjustments by the dentist to correct tooth crowding by producing a “light” outward force to promote jaw bone growth. ALF Device vs Braces? Which is Better to Correct Tooth Crowding and Crooked Teeth? The ALF is a better appliance than Braces for Correcting tooth crowding because the ALF will create just enough room for the tongue and the teeth to fit in the mouth. 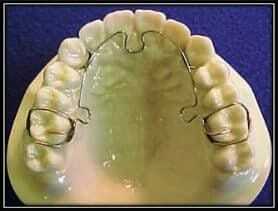 The ALF also results in the jaw being the shape of the tongue rather than the arbitrary shape of a wire. The ALF expansion stops when the tongue stops pushing outward on the appliance. As if it were magic, the human mouth is designed to be large enough to fit all the teeth and tongue – naturally when teeth have enough room to fit, so does the tongue. This is the way things were naturally intended to be. What is an ALF Device and How does it Work? The ALF Dentist / Orthodontist can slowly adjust the “Omega” loops on the flexible ALF wire to slowly increase the diameter of the ALF. By increasing the diameter of the appliance, the effect is a “Light” amount of pressure and stimulation of outward and larger jaw development. Promotion of a larger jaw creates more tongue space, more room for the teeth to fit better and more room for better night-time breathing. The use of “Functional” force is paramount for the ALF to work to it’s full potential. The Tongue will press on the ALF wire and the teeth and is a big part of the force and a “Functional” one at that. If a Tongue is Tied it will not produce a “Functional” force. Tied tongues and Lips are usually the biggest cause of under development and ultimately Sleep Apnea and TMJ problems. To deny it, is to deny the devil has a doing in evil doings…. Treatment times are quite varied and can last as few as 3-6 months or as long as 1-3 years depending on the complexity of the case. The ALF appliance is comfortable and does not usually affect speech. The ALF Appliance being small is easy to clean and does not collect much food. The ALF is the goto appliance for kids with crooked and crowded teeth. The ALF has also been shown to reverse the effects of poor facial development, facial damage caused by traumatic birth, some TMJ pain, and pain and facial damage caused by aggressive retractive extraction orthodontics. The ALF can also correct facial asymmetries, produce palatal expansion, and open the Airway. Many patients diagnosed with Sleep Apnea can be treated with the ALF Dental Appliance. The ALF will open space in the palatal area, creating more volume in the oral cavity and a better resting position for the tongue (so the tongue will not obstruct the airway). The ALF can in some cases cure Sleep Apnea, TMJ pain, and poor sinus and cranial draining. The ALF can be custom designed by the dentist and altered during the course of treatment to correct the specific patients problems. The ALF appliance is very small, comfortable and temporarily placed during the period of treatment. The ALF uses light forces that are round and result in expanding the entire mouth by stimulating bone growth and development.The Expansion and Development is in the natural shape of the mouth and Tongue. A Rapid Palatal Expander uses more force and expands more in the back of the mouth and not the front. The result is usually tooth tipping and a V-shaped mouth. The two main problems with Rapid Palatal Expansion: 1) No expansion in the front part of the mouth (it is critical to create room in the front part of the mouth for the tongue to fit, otherwise the tongue will fall into the airway during sleep) 2) expansion is too rapid so less bone grows, rather there is mostly tooth tipping. Naturally there is tooth crowding in a small mouth. Crowding of teeth is usually treated as a cosmetic problem by an Orthodontist. Children who have small and under developed mouths cannot breath properly through their mouths and noses and normally sleep poorly. ALF Dentist is hard to find because the focus is normally on straight teeth and Orthodontist. Little or no consideration is given to the advantages of orthopedic growth and creating more room in the mouth for better mouth and nasal breathing. When teeth crowding is seen, seeking out a qualified ALF Specialist or ALF Dentist has many advantages. Corrects Crowding of Teeth by creating more room in the mouth for the teeth to fit side-by-side. ALF Dentist uses the Advanced Lightwire Functional in combination with tongue and chewing exercises (aka functional forces). The orthopedic treatment is ideal for Kids and Adults who do not have significant TMJ or Sleep related issues. The goal of ALF orthodontics is to create the proper space in the mouth for Teeth, Tongue, and Breathing and additionally to balance jaws and facial bones. The ALF is an invaluable tool for kids in Holistic Orthodontics. The ALF is an orthopedic appliance that can correct under developing kids jaws with light advanced forces. The appliance can increase jaw development and create room to fit crowded teeth. What Causes Tooth Crowding and Under Development? ALF Orthodontist should be explored in kids with crowded teeth. With proper management of growth, a kid may never need braces or Traditional Orthodontics. More Importantly, a kid may never need to experience TMJ Pain and Sleep Apnea – the ultimate outcome for kids who under develop in the Jaws and Airway. Advanced Lightwire Functional Therapy is a very popular treatment in our Holistic Dentistry Practice. Come see our ALF Dentist or ALF Specialist for a consult. Jaw (aka the Maxilla) is the base of many of the sinuses and the nasal passageway. If your upper jaw is not a proper size and shape, you will NOT breathe properly through your nose and your sinuses will not drain well. The ALF Appliance or Alternative Lightwire Functional is a small flexible and springy wire. The ALF Appliance wire applies light constant forces to the teeth, similar in strength to a developing human tongue. This service is available in Rockville MD and Burtonsville MD. The DNA Appliance is ideal for Treating Adults and Kids with TMJ and Sleep and Airway problems. When an individual has Sleep, Airway and TMJ related symptoms, the problems are more advanced. More advanced TMJ / Sleep problems disrupt nerves, muscles and bones throughout the entire body. The DNA Appliance is an invaluable tool for the TMJ Dentist. DNA Appliance Therapy can treat a TMJ Problem and an Airway problem at the same time. The DNA Device is the appliance of choice when a patient suffers from Sleep / Airway and TMJ pain. Many patients suffering from TMJ Pain, Airway issues, chronic head and neck pain, and failed orthodontics can be successfully treated with An ALF or DNA Appliance. The DNA Appliance is a removable appliance and also treats cases where there is TMJ Pain, Airway issues, chronic head and neck pain, and failed orthodontics.